"For the violin to flourish, the support of someone as influen­tial as Catherine de Medici was crucial. An Italian dance band of violinists, headed by the marvelously named Balthasar de Beau­joyeux, had first arrived at the French court around 1555, before Henri's death but under Catherine's patronage. The band's orig­inal instruments have not survived, but some of their immediate successors do. Soon after Charles IX reached his majority, he and his mother set off for a tour of the kingdom, one that would last two years. At around the same time Catherine ordered a set of thirty-eight string instruments from Italy. Whatever her faults as a ruler, she knew how to buy. The entire set was made in the northern Italian town of Cremona. 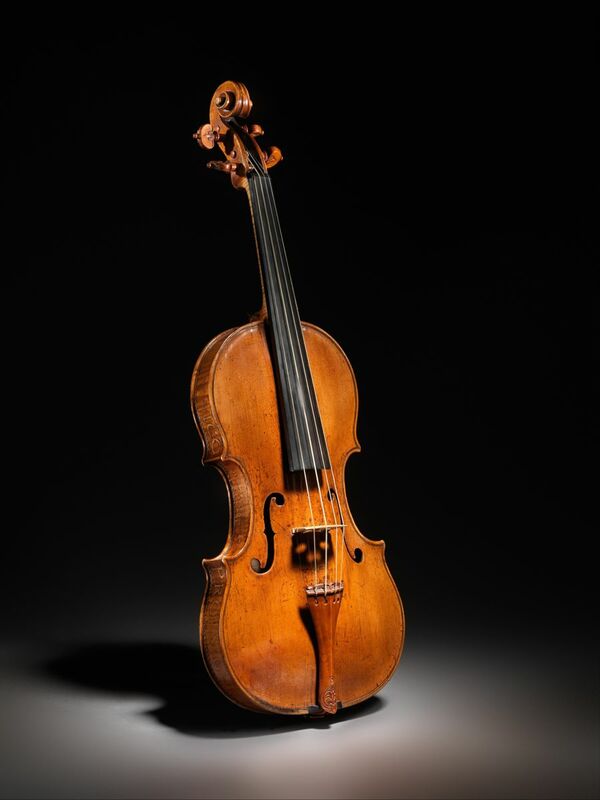 It included that small violin from 1564 that now lies on the floor of its case in the Ashmolean Museum, the earliest surviving violin in the world. And all the instruments were made by Andrea Amati. He and his family would dominate violin-making for the next one hundred years. ex "Kurtz" Violin, ca. 1560 -- This violin may have been part of a set of instruments presented upon the marriage of Philip II of Spain to Elisabeth of Valois in 1559. "The violin is one of the great products of the late Renaissance, the result of a process of evolution, rather than a moment of in­spiration. "By the end of the sixteenth century the power and the ver­satility of the violin were undeniable. In 1581 Balthasar de Beau­joyeux composed the first music specifically for the new instrument, a ballet to celebrate the marriage of Catherine de Medici's daughter. From about 1600, paintings by Caravaggio and others depict the full beauty of the violin: it had emerged from the shadows, a work of art, but also the most advanced technology of the age."